I was just checking the status of the ring. I checked online and it says "pending." I don't know if you remember, but I ordered my fiance's engagement ring from you and spoke to you several times on the phone. I would just like to say that she loves the ring and I appreciate your outstanding customer service. Jewelry stores do provide a personal buying experience on a one-on-one basis, however, do you really need to pay 30-40% more for this service? Conversely, is the risk of being unhappy with your diamond ring purchase greater, without seeing it first? We respond to both of these questions noting that the average length of time spent on our website is 2 hours, longer than you would generally spend on a jewelry store visit. Also, most busy jewelers would be unable to devote that much individual time to only you. Additionally, we are available via email 24 hours a day to answer any questions you have about our diamond rings online. If you would like to speak with one of our jewelry and diamond ring experts, just call into our toll-free telephone lines. 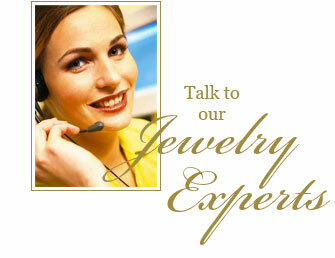 We are happy to spend time answering all of your jewelry questions. We draw upon our over 50 years in the diamond and jewelry business to provide a complete and thorough education to assist you with your diamond ring and diamond jewelry purchases. And remember that our site is open 24 hours a day, 7 days a week for you to explore when it is convenient for you. Our lower overhead on the Internet will enable you to buy a 30-40% better valued diamond. Your extra purchasing power will allow you to upgrade your clarity, color, cut, or carat weight, lowering your chances of being unsatisfied. Our inventory of stones and diamond ring styles are far more extensive than most stores, and our diamonds are certified by world-known independent laboratories. And furthermore, we offer a no risk 30-day unconditional money back guarantee on our diamond rings online. We understand the concern that the Internet has anonymous and short-lived businesses, but so do traditional brick and mortar establishments. However we are long established jewelers that can now offer you exceptional product at great prices through the Internet. Our goal, at Danforth Diamond, is to become your local "internet" jeweler. We want to provide great product and service with your first diamond ring purchase, hoping you will feel comfortable to visit with us again for all your future anniversaries, birthdays, holidays, and special celebrations.